I love traveling. And I am fond of reading travel guides before and while traveling. I like to get the background about the places I am visiting and try to find the best bang for the buck in the limited time I am at a place. I have used Fodor’s guides and TripAdvisor forums in all my previous trips. Schmap’s series of digital travel guides integrates dynamic maps with useful background reading, suggested tours, photos from the traveling public and reviews by local correspondents (for sights and attractions, hotels, restaurants, bars, parks, theaters, galleries, museums and more) to profile 200 destinations throughout the United States, Europe, Canada, Australia and New Zealand. The thing I liked the most about Schmap is that it is available online as well as offline as a desktop application and have all that information in my laptop and use it during the trip. Schmap’s online also has reviews of places and slideshows. You can navigate by interests, needs or neighborhood. Schmap 2.0 is the desktop application that offers you trip planning convenience. 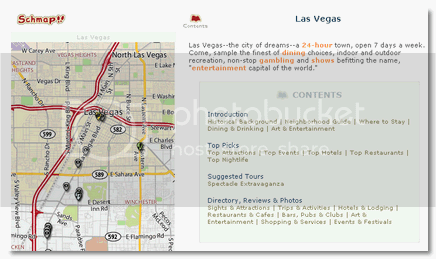 You can take virtual tours, custom print full-color guides and publish itineraries. You could also download Schmap Megapacks and download a bunch of guides in one shot. Schmap also offers fully customizable mashups that you can publish to the web with a single click – Schmapplets. Shmapplets, in short, is way for you to share travel recommendations, trip itineraries, reviews, etc with friends and family. If you are in a Travel related business, you can add Schampplets as an interactive mapping element and share information with your readers or clientele. When you are getting ready for a trip next time, give Schmap a whirl or you could just download the desktop version and take virtual tours of faraway places. It’s best to be prepared and make sure any shiitake happens in your trip to a new place. Cool! No more lost tracks 😀 Thanks for sharing! This looks like a useful resource, I’m looking to do some travelling in the next year and this would no doubt help with my sightseeing. I see that they have an app for iPhones, couldn’t see one for Windows Mobile though, I hope they release one for that platform too as this info on a mobile app would be great! Sounds awesome! Finally a way to combine real maps (not just GPS), with travel recommendations, rather than just local stores listed. I found out about Schmap when they contacted me via Flickr. They wanted to use a couple of my photos on their site (photos of Germany). At first I thought it might have been some kind of scam but now I actually use their site when planning my trips. Schmap is pretty useful when you want to use it as a desktop application, and not have to use the internet! That’s perfect for needing to check things without having to find that wifi cafe in the middle of no where, lol. I have actually found schmap very useful. We were used to find some cool stuff to do for a two day trip we took during my school holiday and went to one of the “Top Restaurants”, and it was bloody good. Get 80% off in travel benefits. “More haste, less speed” as the saying goes that can maybe give the adequate explanation and characteristic to this very digital device. It’s nice idea to think that there is the guarantee of first-rate travelling round the world. Schmap just made my day! But should we remember that ” the farthest way round is the nearest way home”? I guess so. Joels last blog post..Slot machines: have fun and win! Hi! I wanna travel to some more exotic countries as India, Sri-Lanka or Myanma.. are there any advics for me? or may be some visitors can help me where i can find a nice travelguide? thanx in advance!!! With the price of GPS units coming down fast this past year, I wonder if services like Schmap would still be needed or in demand. I just got a 3.5″ unit for $79! Perhaps if there are more points of interests on Schmap, then there might still be a need for it. Those maps seem very detailed and also very user-friendly. It seems like a great service for any serious traveler. Thanks for sharing, this sounds like a service that can be very useful for me. This one will be great for travel geeks like myself! Supergeek to the rescue! Baseball card boxess last blog post..So far so good! Like the author of this post, I like traveling as well. My favourite place is Dublin city. That’s why I like this article very much.